Can Pep is a beautiful ancient finca situated in San Ferran, near the heart of the island. The house, with its old world charm and peaceful setting will have you relaxed soon after you arrive. Set in the countryside, with a large lush garden of fruit trees, boab & established olive trees, Can Pep blends sympathetically with the natural surroundings. And being one of the original Formentera farm houses, its oozes an authentic rustic charm which will make you feel at home. It is a fabulous finca to make the most of the island and experience the true Formentera. This fantastic finca has many character features and a comforting feel, with its thick walls keeping the house cool during the hot summer days. It has four bedrooms, three with double beds and one with two single beds. One of the double bedrooms is accessed from the outside. There is a lounge with a working fireplace, dining table, sofa and TV with doors opening out onto one of the terraces. The separate kitchen, accessed off the terrace, has most appliances including an espresso maker and laundry facilities are available with an ironing board and washing machine. Also provided is a stereo and a fan. Can Pep is surrounded by the beautiful Formentera countryside with a traditional feeling as soon as you arrive at the house. It has private parking and has a large garden with various trees & flowers. A bbq and many items of outdoor furniture are provided. Sit under an olive tree and read a good book or play games in the garden. This Formentera finca is the perfect place to make the most of the lazy summer days in this island paradise. The area of San Ferran has various shops, supermarkets & restaurants. Just up the road is the charming village of Es Calo with a beautiful bay for swimming. 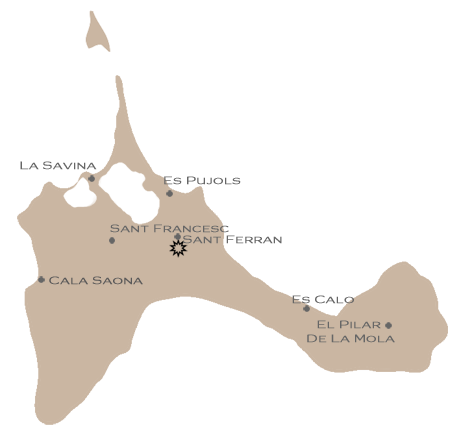 San Francesc is a nice bicycle ride away for all other amenities including banks, post office, boutique shops & more restaurants. And the famous beaches of Illetes are not far away, being a short bicycle ride.